The world economy is slowing down and the authorities are fretting. Japan, Italy, and Greece are all in recession. China is slowing down according to official statistics, and even more according to whispered accounts. Germany, France and the Netherlands are all at stall speed. According to the BLS, the United States is doing just great at nearly 4% growth for two straight quarters, but you wouldn't know that either from the quality of the few jobs being created (which is low) or from consumer spending (also low). The worry, as always, has nothing to do with the central banks' concern for you, your job, your children, the actual prices you pay, wealth equality, or the future, and everything to do with the simple fact that the stability of the banking system absolutely depends on a steady stream of new loans. The problem, as always, is that we have a monetary system that is either expanding or collapsing. It has no steady state. Either money and credit are expanding and the banks are relatively happy or the banks are collapsing and demanding taxpayer bailouts. It's really that stark. We are being driven by our system of money, we serve it not the other way around, which is a tragedy of both epic and comic proportions. I guess with the binary choices of growth or collapse before them it only makes sense for the current crop of central bankers to do whatever it takes to keep that system limping along, er growing, for as long as possible. In 2008 and 2009, net credit creation was only slightly negative, but that was enough to very nearly cause the entire system of money and banking in the developed world to collapse. Now after the most heroic period of interest rates forced to zero (ZIRP) and below (NIRP in Europe) and the grandest experiment with money printing in global history, credit growth is somewhat back on track but not enough to ease the banker worries or to justify their actions. So the bankers continue to pump, jawbone, and panic at every slight downturn in financial market prices because that's all they have left in the world upon which they can hang their reputations. The actual economy, the one that lives on Main Street, never really bounced back fully, at least not compared to past recoveries. Growth, jobs and incomes all were anemic compared to prior recoveries. Investment in new capital was and remains dead in the water. Left unsaid by practically everyone, always, is that it was never a very good idea in the first place to weld our perceptions of adequate economic growth to a scheme that relied upon continuously compounding debt at a faster pace than economic growth. We did this for so many decades in a row that everyone forgot to question whether it made sense to do this. It did not, but too many decades had passed for anyone to remember another time. So when the crisis came, which was rooted in too much debt, there were no sane voices in the central banks or halls of government power saying, hey you know what? That wasn't such a good idea. Perhaps we should pay off our past debts and then take on new credit at a pace no faster than our growth in income. Instead, there was a blind adherence to the prior policy of fostering rapid credit creation, not because it made any particular sense at all, least of all math sense, but simply because that’s how things had always been done. Well, not ‘always’ but at least during the past 4 decades when everybody in power was learning about how things are done. Looking forward, not only does it not make sense to attempt to increase debt faster than income, it makes no sense to continuously compound debts and other claims on real wealth because resources are not infinite. Whether it's now, or in ten years, or in a hundred, sooner or later the economy of 'stuff' cannot grow any more simply because there won't be enough land, ore bodies, or energy to do do so. Just because a lot of powerful people are ignoring something does not make it go away. Bad ideas are still bad ideas whether they are being ignored by even the most important people, or not. The world’s central banks have been given a lot of leeway as they’ve done what they can to stimulate more economic growth. Leaving aside the impossibility of sustainable exponential growth in a finite system, how have the central banks done? How would we score their efforts so far? Well, if you are in the Eurozone or Japan, the answer has to be ‘poorly.’ Trillions have been spent, government deficits, enabled by central bank printing, have exploded and yet growth of the sort that could justify these efforts has not returned. Massive new debts and no improved means of paying them back. Why people will spurn a company that engages in such obviously poor financial and management practices but give a free pass to nations and central banks that do the same thing is a mystery to me. If the past efforts have not yielded the expected results then what will even more of the same efforts brings us except a bit more time before an even larger financial accident? Those in charge always arrive at the same conclusion, which is to even more of the very things that have already not worked. Given the macroeconomic data as we have it, there's nothing that would rationally or logically support the prices we see for equities and bonds we currently see. Both equities and bonds are priced to perfection, eagerly awaiting a world where high economic growth can justify their historically elevated prices. Our view here at Peak Prosperity is that the days of rapid economic growth are behind us, and that if we do experience rapid growth again it is from much lower levels as we rebound from some major slump. But to grow even more from here, even if that's just 4% annually across the globe implies that we'll find a way to fully double the entire world's consumption of resources in just the next 18 years. That's the nature of compounding...even 4% growth means a 100% increase in just 18 years. Because oil is the main engine of growth, and we know that even with 2.5 trillion dollars of additional spending over the past 9 years the world is producing roughly the same amount of oil as ever. Why? Because depletion of existing reserves is being matched by new production. Unless investment in oil production really accelerates from here, new production will be swamped by existing declines. In the US we know that even under the best of circumstances shale oil, the one and only engine of increased oil production growth, will peak in 2020. 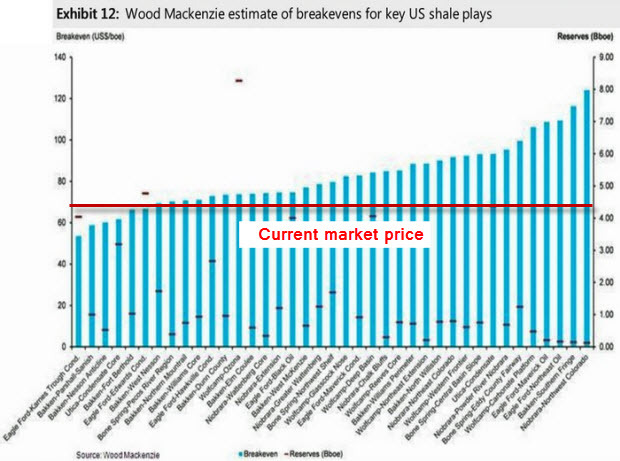 As we can see in that chart, the only plays that are still viable at today's prices are the core areas of the Bakken and Eagleford plays, which should not surprise anybody. Those were the ones drilled first and hardest because they are the most economic. Oil prices most recently peaked in the summer of 2014, and then began a slump that really picked up steam in October and now everybody is talking about it. The fun thing about the shale companies is that they are incredibly nimble and very sensitive to prices. They can stop drilling at any time. As soon as they do, the peak of shale production will be measured within a month. (Reuters) - Plunging oil prices sparked a drop of almost 40 percent in new well permits issued across the United States in November, in a sudden pause in the growth of the U.S. shale oil and gas boom that started around 2007. I have to ask - 40% - is that a lot? Yes, it sure is. And in just one month. Notice that the decline in permits was even quite pronounced in the core shale plays revealing that even within the Bakken and Eagleford there are operators who don't believe it makes economic sense to drill at these oil prices. The shakeout that is coming to that industry is going to be quite pronounced and we're expecting some serious fireworks as investors wake up to the fact that sometimes defaults really do happen and losses are a part of this game....something the central bank liquidity injections have managed to mask and forestall for quite some time now. The bottom line, though, is that without growth in oil economic growth is hard to achieve. I'll go further and say it's impossible to achieve, at least under the old paradigm of consumption based growth. If oil prices do not recover and quickly, the US shale miracle will rapidly turn into a shale bust. The decline rates on these wells are ferocious. With that loss of production will go the entire narrative that says our energy predicament is safely off in the future and that we can safely ignore it for now. And with the loss of that fantasy will go the sky-high valuations we currently see for stocks and bonds. After all, the operative question always should be what is the value of these stocks and bonds in a world without growth? To me the answer is simple; a lot less. Unfortunately nobody - and I mean nobody - in the any central bank is even remotely talking about or in any way displaying that they are even dimly aware of the role of energy in economic growth. To them it is all about the banks. And the banks need growth like your body need oxygen. Sure, you can hold your breath for a minute or two, maybe longer with training, but after that things get dicey and quickly. There are signs everywhere across the globe now that the central banks have failed to induce growth in the real economy, and have instead simply bought some time at the expense of pushing things even further into a zone of massive malinvestment, rank speculation, and badly inflated prices. In short, we are now past the point where the next correction could be survived injury free. It's going to hurt. In Part II: Central banks have lost, deflation is here, we look at the various global warning signs that slow growth has morphed into something more deadly to the banking system; deflation and recession. We'll discuss and review the basic commodities that are telling us far more than the distorted stock or bond prices ever could about the true state of global growth and future economic prospects. Copper, oil, iron ore, coal, gold and silver are all telegraphing major economic weakness ahead. The next round of deflation will be absolutely punishing for financial markets and possibly even spark international conflicts given the raw state of diplomacy and east-west tensions. Things are so tense I have the sense they could snap at any time. The central banks have done everything they can to paint the picture of recovery and health by driving the prices of equities and bonds higher and higher. But that's about the extent of their powers, considerable though that one feature might be. The social mood darkens, though, and that is always one indicator that all is not well. We may well be treated, however, to massive race riots, spiking unemployment, goods shortages and the Dow at 20,000. It would be like something straight out of an Orwell novel. Perhaps we ought to rename the Fed the Ministry of Reality? Every corner of this world is still not able to overcome the recession period of 2011. Everyone is recovering but slowly slowly. In this state of world economy, Real estate is the business where you will not loose anything. You can loose in gold and silver because sometimes their prices are also changed drastically. This time it is not good too invest anywhere instead of real estate. Other remaining things are effected by the deflation, so oil industry also suffered from the changes. Thanks Chris, well written, as always. Here in Quebec investment companies are buying land like crazy; acre's price is increasing above what is sustainable for real farmers; they bought almost 1% of total agricultural land in a few years. They are converting paper money into hard assets... this is also a strategy to take control of the land. Meanwhile Quebec lost almost 1000000 permanent jobs in 2014. Housing market is stagnant. food banks are seeing a shift in their customers: from homeless now they see more and more low income people. Mining companies are closing mines in the Great North ("le Grand Nord") because of low prices. Taxes at both provincial and municipal levels are quickly rising in a temptative to reach the "zero deficit". provincial debt is around 265B$. And I guess there is nothing specific to Quebec. I don't have the situation in other provinces, but it should be similar. Alberta is having problems because of declining oil prices. and Alberta was the leading horse in Canada. I have to admit that many of the your articles and writings over the last several months have taken on a more dire tone. The information and analysis is first rate, as always. And very appreciated. The same comment can be made about several of the people who contribute to these discussions on a regular basis. However, you have certainly been more aggressive in your criticism of the Fed, and your language has been pushing a constant and heightened level of concern. I know the circumstances are different as each month passes...but I'm wondering if you are considering issuing an "alert" to your general readership. Perhaps this question is very premature, and perhaps your gut is not enough to go on alone. Maybe months will go by and the current state of affairs won't drastically change. With information communicated here (and other places) I have elevated my preps though. If I am wrong, oh well. More food in the pantry, more wood for the stove, etc. A few more ounces of silver hidden away. In the past, I know you issued one with the nuclear disaster in Japan. I believe you may have also done something similar when the Greek debt situation got really bad. Gee what a coincidence, just as our new old cold war is ramping up our OPEC friends lower the cost of oil. Could it be they want to smash Russia? Regime change against Putin could be what they are going for in full force. I concur! That is the situation that I see as most probable for the short-term (next 1-2 years). I've been trying to reconcile the perspective and opinions of Jim Puplava at Financial Sense Newshour with those of Mish, Kunstler, and yourself, and I'm increasingly sensing that BOTH sides will probably be right. US stocks are certainly looking bubble-icious yet I think Jim Puplava is probably right that it will head higher and by its nature will lure in more of the suckers... er, investors... in before it crashes, and yet I sense that you are right in that this is partly an illusion and the real economy as a whole and the average person's fortunes will continue to steadily decline. Asia and Europe will probably continue to get hit hard next year which will likely see money moving to the US for the short-term, which will help keep the US stock and financial markets afloat for a little bit longer. But eventually the bad social mood will dominate and that tide will recede, and then it'll be our stock markets' turn to take a beating. And even before then I think we'll see a build-up of social and political instability domestically and abroad. I think next year will be exceptionally chaotic and make this year look dull by comparison. Yes, with the current form of financialism bubble-icious is the only option. We destroyed our economy as we are destroying the ecosystem. In 2008 I was watching GPS with Fareed Zakaria who was interviewing Christine Lagarde, and he asked her whether we were in fact building a new bubble and she answered. "It's the only thing we have to work with." I guess that just says it all, doesn't it? The scary thing is whether destructive behaviours are the only way out. Anybody who's taken Economics 101 knows that market price is driven by supply and demand. Much as we hate to admit it, the inflated oil prices, like all other inflated commodity prices, was hinged on the notion of that "China growth story" which caused capitalist speculators to pile into commodities. Now that the real truth of economic slowdown has emerged from China and Europe, all that stupid speculative American funny money has evacuated the commodities sector, favoring their own domestic equities to try to capitalize on some of those trillions in Quantitative Easing dollars. It does not take a genius to realize that the record highs of the NASDAQ and Dow Jones are artificial and unsustainable and that Americans are setting themselves to be screwed over yet again when the bubble pops and Wall Street banksters make off with trillions of dollars of Main Street citizen's 401k's (again). Meanwhile the US government has become very good at manipulating economic reports (and you thought China and Russia are untrustworthy) to keep American citizens in the dark about the real truth of unemployment, economic stagnation and the massive amounts of money continued to be spent on their 21st Century Crusade. Glad I'm NOT a US Citizen. Glad I'm NOT a US Citizen. And I'm glad that I'm not a member of a fossil fuel based global industrial civilization with at least eight nuclear powers! Anyone ever hear of this??? What is the practical significance of the findings? Levine points to a recent study by the Graduate Center of the City University of New York, which found that more than half of Wall Street's workforce was made up of white men who earned more than twice as much as women and minorities. In the financial center of London, there may be even less diversity, suggest data from recruiting firm Astbury Marsden, Levine said. We certainly are special. Is there Nothing that the white Anglo-Saxon male is not responsible for? As from my point of view, it puts in place several of the puzzle pieces.